In 1928 he created “Steamboat Willie” introducing Mickey Mouse, and from that point there was no stopping the king of family entertainment in the U.S. Youngest of twelve children of Jewish immigrants from Poland who with three brothers established Warner Bros. which he ran with a firm hand until 1967. Child actor and newsboy who started in the wardrobe department in 1919 and became a top director/producer. Began as a writer and always looked for the strong story, as evidenced in the films during his time as the head of production for 20th Century Fox. The beloved Frenchman came to Hollywood 1929 but was denied re-entry in 1935 due to his political views. By ’59, he was back, however. Vocalist-drummer turned singer turned actor–the world loved that memorable voice and personality, and so did the HFPA. One of the immortals; began his career at age seven, danced with Ginger Rogers in ten films and then with Rita Hayworth, Eleanor Powell and Cyd Charisse. Born in a trunk, in films since 1935. When she received the award, “A Star Is Born” and her dramatic vignette in “Judgment at Nuremberg” were fresh in everyone’s memory. From vaudeville to movies where seven “Road” pictures with Bing Crosby and Dorothy Lamour as well as parodies and comedies made the world love him. Born in direst poverty, a school drop-out at 14. As producer and founder of Embassy Pictures, he knew how to create excitement around his movies. An intriguing leading man who came to represent the finest of American character traits. He became the cinematic symbol of the strong man of few words who could solve every tricky situation and problem. Since his debut as Mark Antony in “Julius Caesar” in 1949, he remained the quintessential portrayer of heroes. An actor in films since 1946, a producer of films such as “Spartacus,” he was also the U.S. Goodwill Ambassador since 1963. He combined his acting (“To Kill a Mockingbird”) with being active in charitable, civil rights and film industry causes. From 1925 and throughout the ’60s, she was the reigning queen of the Hollywood filmscape. A singing/acting legend, loved and revered by countless fans all over the world. Hailed as the unmatched master of the thriller genre, first during his so-called British period, then in American films. She began her screen career in 1931 and remained active for nearly 60 years, playing willful, liberated, spitefully independent females. From motion picture theater manager to assistant to head of publicity at Warrner Bros. to becoming one of Hollywood’s most successful producers. A Harvard graduate who worked his way up the administrative ladder, formed the Mirisch Company, Inc., with two brothers. The son of a circus clown who died before he was born, he was the star of many MGM comedies, combining these with superstardom on television. 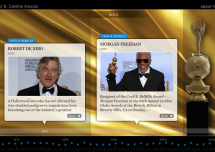 When the HFPA honored him, there were memorable roles to look back on, except one–his last… “On Golden Pond” hit the screens the following year. He danced, choreographed, sang and acted his way into our hearts from 1942 (“For Me and My Gal”) and on. His charismatic screen persona brought him into definite leading man status. By this time, he had also directed films for ten years. Lord Olivier acted from age nine and was especially known for making Shakespearean plays and characters come alive. An enduring superstar with intelligence and humor saturating his roles–who had also demonstrated a distinct flair for directing. Having made her Hollywood screen debut at age ten, she became part of the world’s cinematic royalty. Cecil B. DeMille‘s favorite actress, equally at ease in comedy and drama–this was the year she left films to concentrate on television. Born in Mexico, he entered films in 1936 after a brief stage experience. In addition to his acting, he is an accomplished painter and sculptor. “The Man With No Name” who ended up by being known by just about everyone on earth. Versatile as an actor and also as a top director. She came to represent grace, radiance and soulfulness–her appearance brought to mind delicate china but with the endurance of stainless steel. This Harvard-educated, piano-playing actor with a remarkably broad range had by this time made some forty-four motion pictures. A rugged leading man for more than four decades, whom Deborah Kerr said was a hundred times greater as an actor than he himself believed. Being publicized as “The Look” early on, she soon proved to be much more than that–having “cinema personality to burn,” to quote James Agee. A movie hero with boyish looks whose strong ideas and ideals led into producing, directing, and the establishment of the Sundance Institute. The slave girl in “Quo Vadis” in 1949 went on to impress in a succession of roles (who can forget “Two Women”?) in more than 80 films in Italy and Hollywood. The handsome Scotsman began acting in films and on British TV in 1954. After being James Bond, he went on creating strong men in scores of films. Erupting on the screen in “The Graduate” (1967), he has not stopped acting with body, soul and heart since. A living legend who doesn’t think of himself as such, an enduring superstar simply because he is a terrific actor. Singer, actress, film director, producer, writer, and composer whose popularity has endured and grown for nearly four decades. One of the greatest actors in all of film history, Al Pacino established himself during one of film’s greatest decades, the 70s, and has become an enduring and iconic figure in the world of American movies. His tremendous ability with “ordinary guy” roles has been rightly praised, sometimes at the expense of his equally impressive comic timing and the undercurrent of eccentricity that sometimes floats to the surface of his straightest roles. A Hollywood icon who has not allowed his star-studded pedigree to impede him from becoming one of the industry’s greatest. Educated at Juilliard, his talent has carried him gracefully through roles hilarious, dramatic and bizarre. His reserved character and personality belie his explosive energy on screen and his outstanding power of expression. Recipient of the Cecil B. DeMille Award ñ Morgan Freeman @ the 69th Annual Golden Globe Awards at the Beverly Hilton in Beverly Hills, CA on Sunday, January 15, 2012. On Sunday, January 13 2013,Jodie Foster, the recipient of the Cecil B. De Mille Award of the 70th Golden Globe Awards, thanked the honor in kind, with a speech that became one of the highlights of the evening. 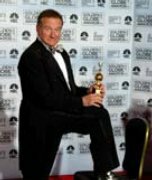 GOLDEN GLOBE(S)®, HOLLYWOOD FOREIGN PRESS ASSOCIATION® and GOLDEN GLOBE® statuette design mark are the registered trademarks and service marks and the GOLDEN GLOBE® statuette the copyrighted property, of the Hollywood Foreign Press Association. Copyright © MM-MMXII Hollywood Foreign Press Association. All rights reserved.